Bohol is one of the most popular islands in the Philippines, mostly thanks to a wide selection of attractions and activities. Combined with stays at world class resorts, the island offers the ultimate mixture of exciting adventures and relaxing days at the beach. The list of things to try at this beautiful island is endless. You can squeeze many attractions into one day or spread them out over a few days for a more relaxed itinerary – it really depends on how long you’ve got. The best thing about the tours in Bohol is the fact they all require relatively low effort – so they are suitable for all family members and fit in well with the island’s overall relaxed atmosphere. All of our Bohol day tours include hotel pickup / drop off with a van, complimentary lunch, all fees and a licensed tour guide. They can all be customized to include specific locations or activities you’d like to try out. All these tours can also be added to any of our Bohol packages, so that it also includes airfare, accommodation and everything else you need for the perfect trip to Bohol. By Booking these tours through us you are guaranteed a front row seat to some of the most breathtaking attractions in the world. Browse through our catalog of day tours in Bohol, or contact us now for advice on which tours are most suitable for your group. These tours are all available either as private tours or shared. By joining a group, you can save a lot, but you will have to share the boat with 4-8 other people. Taking a private speedboat is also possible for an added cost, and it means you’ll have much more flexibility. Shared tours might not go out unless there are at least 5 tourists who booked it. If you’d still want to go anyway, you might need to pay more. Best time to visit : March to May. Attractions in Bohol are mostly low-key and that’s what makes the island one of the best family destinations in the Philippines. Still, that doesn’t mean the places you’ll visit here are any less beautiful than those at Palawan or Siargao for example. As with most islands, the emphasis here is on nature and wildlife. Bohol has some of the most beautiful coral reefs and diving spots anywhere in the country, and it’s also a great place to get certified in. On top of that, the mainland attractions are also interesting and extremely unique so the overall value you get from your day tours here is extremely high. We only work with the best tour operators on the island – people who have been there for years and know how to run these tours smoothly. Your safety and satisfaction are always our top priority, and we always work on improving our services and making them as flexible as we can. If there’s anything you’d like to do in Bohol which isn’t featured on the list below, all you have to do is contact us and ask. The itinerary for this tour is quite flexible, especially if you decide to book it privately. Still, there’s no doubt Balicasag island is the pinnacle of this experience and you should spend most of your time there. Balicasag is a marine sanctuary, widely acknowledged as one of the most beautiful and special places in the Philippines. The stunning beach, combined with never-ending coral reefs and rich marine biodiversity make it the ultimate island-hopping destination. It’s one of very few places which can rival the famous spots you’ll visit in El Nido island hopping or Coron tours. The main attraction in Balicasag are the sea turtles. If you spend enough time there, you’ll have a very high chance of swimming with one and seeing it face to face. This is why we normally allocate 3 hours to this part of the trip, but of course it can be shortened at your request. You don’t have to decide beforehand –go there and once you had enough just let your guide know. Our island hopping tour includes the boat, life vest, snorkeling equipment, paddle boat, EUF (Environmental User’s Fee), lunch and a licensed guide to accompany you all day long. Price for a couple is 50$ each, while 3-4 people would be 35$ per person only. Any additional person added beyond that would result in a 25$ increase – up to 8 people max. Children under 6 are free, and between 6-10 enjoy a 50% discount. Another, slightly different inclusion is Pamilican Island. This is a much more remote location which usually attracts only divers thanks to its underwater riches. Since the island is a 40 minutes sail in the opposite direction, it requires a separate trip. The price for this tour is 1000 PHP per person (20$) and it comes with all the same inclusion as the regular island hopping tour. 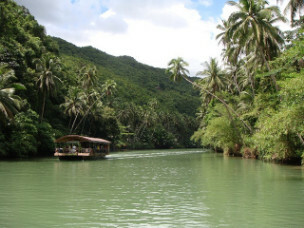 This is a great choice for couples as it one of the most romantic places in the Philippines. Alongside the island hopping tour this is the most popular activity in Bohol, which makes sense as they complement each other very well. If you only have 2 days to spend on the island, booking these 2 tours will ensure you get a full taste of what the place has to offer. The main highlight of this tour is the famous Chocolate Hills. There are an estimated 1776 hills spread over 50 square kilometers (20 miles), creating a one of a kind geological formation. The countryside tour only takes you to the viewdeck from which you get a stunning panoramic view of the hills. People with more time to spend in Bohol, should consider taking an half-day tour of just the hills for a more complete experience. You can find all our Chocolate Hills tours, including the popular ATV rides, on this page. The itinerary for this tour is also flexible, and guests can choose to spend more or less time at each location they visit. Tours include a private car or van, licensed tour guide, soft drinks and snacks and a BBQ lunch. Price is 50$ each for a couple, and 30$ per person for groups of 4 or more. Entrance fees, taxes and environmental fees are all included in the tour package already. Bohol is one of the most established diving spots in the Philippines and is considered the best place for beginners. The diving scene is very mature – with highly experienced and professional dive clubs offering courses in multiple languages. We only work with the very best dive clubs to ensure your safety and quality service are always observed. Bohol is the best place to get certified in before continuing to other locations for more complicated dives. 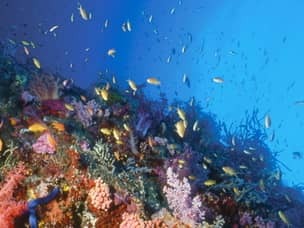 You can try out diving here and see if you like it, then head on to places such as Coron or Malapascua which are considered some of the best in the world. If that sounds like something you might be interested in, take a look at our specialized diving packages. Diving certificates will take between 3 to 4 days to obtain, depending on how much you want to rush it. It involves 6 dives at varying times of the day and a written theory test you’ll need to pass. The basic open water certificate costs 350$ per person, while advanced open water costs 250$. These courses will mean you are PADI and SSI certified and can perform almost all of the dives in the Philippines. People who only wish to try out diving once, can easily do it in Bohol. You can start with just a fun dive and see whether or not you like it before committing for the more expensive courses. One Discover Scuba diving costs 55$ per person, or you can get 2 dives for only 95$. If you decide to complete the course after taking these dives, they will be counted towards the amount needed to get certified. For more experienced divers, Bohol offers a wonderful selection of wonderful diving spots. Make use of the professional clubs and world class equipment to enhance your trip with some new diving experiences. Specialty dives such as night dives, water rescue certificate (2 days), wreck diving, deep diving and much more all are available. For all available activities and a detailed pricelist, please contact us directly by mail. Since Bohol is a also a popular beach destination, there’s a lot of fun activities you could try. Wakeboarding, Parasailing and jet-skis are all available upon request and you can easily spice up your day at the beach with one or more of these. On top of that, there are banana boat rides and flyfish at most beach areas. Two activities which are bit more special are the glass bottom boat and helmet diving. Both of these let you witness the amazing underwater world of Bohol without having to know how to dive. The helmet diving in particular is a unique experience since the only other place where you could try it is in Boracay. The glass floor boat can accommodate up to 8 people so it’s a perfect activity for families, especially with young children who can’t swim too well.